Well as autumn approaches, and the nights draw in – we do tend to turn to comfort food. When glamping in the great outdoor a night huddled around the fire pit with treats is the perfect way to end the day, and smores are the perfect answer. Marshmallows are the go to treat – grab s stick or a skewer and pile them on – we use naked marshmallows – which have a range of amazing flavours including elderflower & Prosecco and salted caramel. We stock them in our pantry and always add them to our hampers. In addition to glamping and the day job I also make a dark chocolate spread with five different flavour combinations, including espresso and caribbean, it’s called Hussh and is the perfect accompaniment to a marshmallow. Visitors get a complimentary pot in their hamper to try – another one of our special touches! But we can go one further – combining the best marshmallows with rich dark chocolate spread and sandwiching it between well – something and you get the perfect smores – so we went on the hunt to find the perfect third ingredient a bread equivalent for a smores sandwich. Many use digestives, as the bread in their smores sandwich – and they do the job, but are a little crumbly. Others use rich tea – with a bit more crunch and – well, can be messy. So we decided to broaden the search to include wafers and hit jackpot. We stumbled on the toffee wafer, it is thin, pretty big – so better for holding those marshmallows and adds a lovely ‘chew’ to the experience. 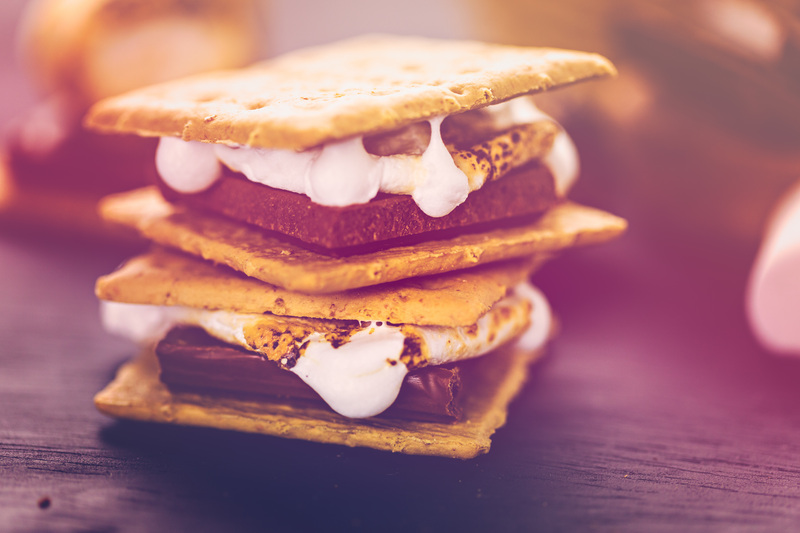 So worry not guests and friends when staying with Upsticks you’ll get all the ingredients in your hamper to make perfect smores – and I can vouch for that personally as we’ve tried and tested quite a few.